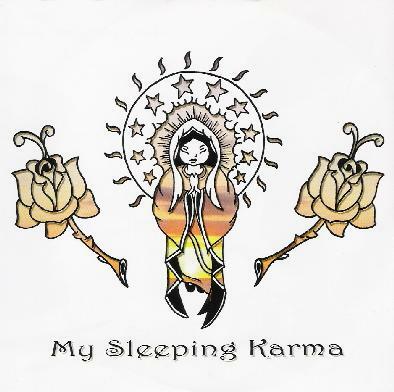 My Sleeping Karma are an all instrumental guitar/bass/drums/keyboards quartet from Germany that were formed (at least in part) by former members of The Great Escape. The music is a stoner inspired brand of space rock that often bears strong resemblance to Farflung. "Intention" opens the set and lays down a throbbing spacey psychedelic groove that right away made me think of Farlung. "23 Enigma" starts off similar but is much dreamier and with a really nice melody. But about halfway through the band launch into a rocking psychedelic stoner jam, bashing out power chords, yet alternating between the heavy rock and dreamy melodic drift. "Hymn 72" is next and before the first minute was out I already liked it better than the first two tracks. The band lay down a cool rocking groove with strong melodic hooks and a deep space vibe. I like the combination of stoner guitar riffs and spacey keyboards played at a solid rock n roll tempo. At 5 minutes this is the shortest track of the set but it's a potent power rocking stoner space tune. And from this point on things get even more overtly space rock. The guitar often reminds me of Afresco Mantis (a band Mr. Quimby's Beard fans would know). That psychedelic throb that gave such a boost to "Intention" is back, and works well in combination with the guitar, swirling space synths, enticing melodies and overall rhythmic pulse. Musically it's all fairly simplistic and My Sleeping Karma never stray very far from their basic established sound. But overall I found this to be a very cool stoner/space rock blend, and the band clearly have a knack for simple but more than effective melodies and seductive jamming grooves. I found myself spinning this frequently on my iPod at work for several days as it's definitely good jamming music for your head. For more information you can visit the My Sleeping Karma web site at: http://www.mysleepingkarma.eu. Hear My Sleeping Karma at their Myspace site: http://www.myspace.com/sleepingkarma.